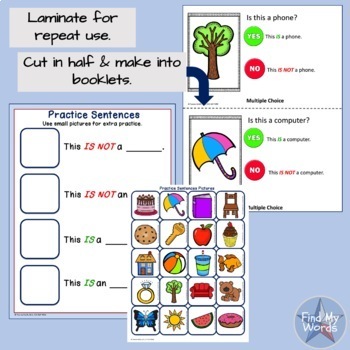 Negate This provides multiple choice “yes it is” or “no it is not,” responses with visual cues that help language-impaired children get the concept of "not." 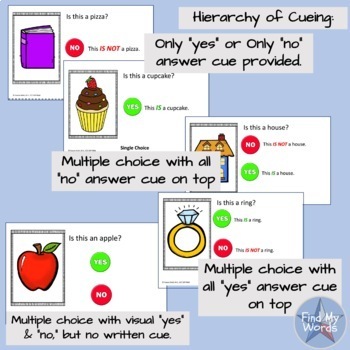 The product includes a cueing hierarchy for multiple choice, with both “yes” on top and with “no/not” on top, for those sneaky ones that figure out patterns. 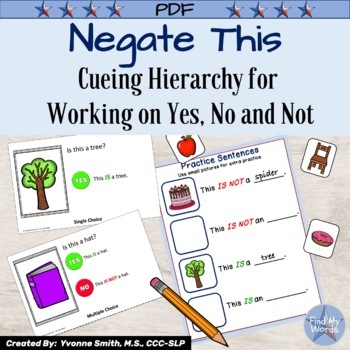 There is also an option for working on just the concept of “yes it is,” as well as working only on the concept of “no it is not.” The last level of cueing has no visual choices, and only asks, “Is this a ____,” and the child has to come up with the answer on their own. 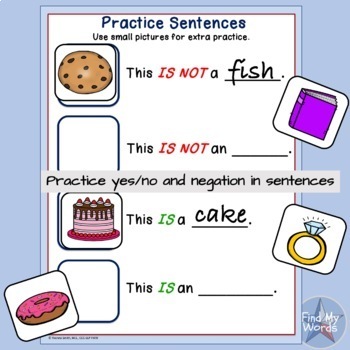 I have also provided a page with sentences for a visual prompt of how to answer.